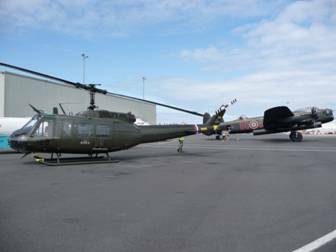 2009 is the 100th Anniversary of the first air display held at Blackpool and to mark the occasion Blackpool Tourism organised an Air Show, to which Huey 509 had been booked to attend. Rob Tierney had volunteered to fly the Huey for this event with Bradley and I as Rob’s Crew (unfortunately Phil's business commitments meant he was out of the country for this event). Sunday saw us heading over to base for 10.30. Rob and Jo had already opened the doors and Rob was well on with his pre-flight checks. The MUTT was positioned at the nose of 509 ready to receive the tow hitch once it had been attached to the skids. The wheels had been left on the rear of the skids from the previous weekend’s outing so all we had to do was jack her up and with Rob hanging on the tail the 'A' bar was attached and then connected to the MUTT. I sat behind the wheel of the MUTT and slowly nudged 509 out into the field with Rob guiding. Once out we removed the 'A' bar and then lowered the rear wheels. The rotor tie-down was removed and then the blades were walked round three times to get the oil and grease moving. Whilst we loaded the gear we might need at Blackpool Airport for the day Rob made his final checks for the NOTAMS and weather forecast. Happy all was OK, Rob and Bradley climbed in the front and I stood outside to keep an eye on things. Rob ran through his check of the cockpit and pressed the starter button. As everything wound up I checked to make sure nothing untoward was happening on the outside. I made the final checks around the outside of the Huey making sure doors and hatches were properly closed and secured. I also checked in the engine bay for any fuel or hydraulic leaks and checked underneath the aircraft for any telltale signs. Happy all was good I told Rob and he signalled for me to climb in the back. 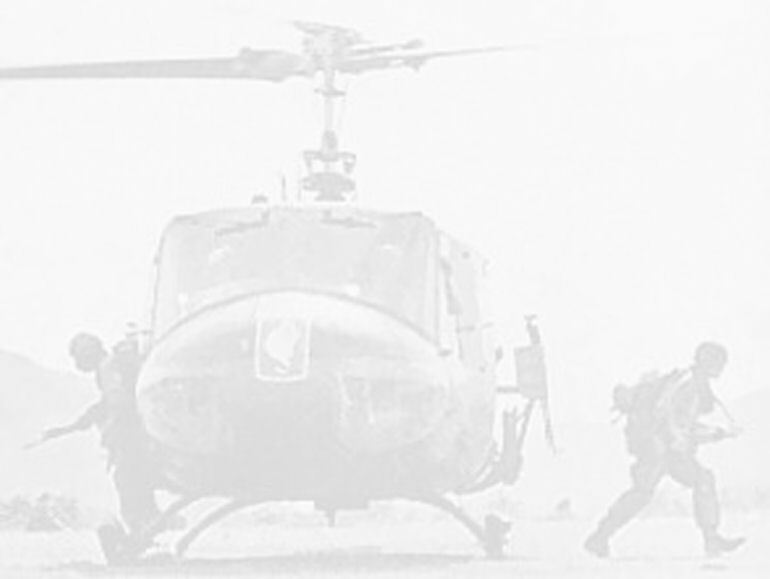 Final checks were made to the working of the Huey's systems and Rob pulled pitch and 509 lifted into the air. Contact was made with Blackpool approach who instructed us to fly to the gasometers just outside the airfield and then to report once again when we were there. An uneventful 10 minute flight and Rob was back on the radio to Air Traffic Control who this time asked him to hold just off the northern edge of Runway 28 at the eastern end. Once there Rob hovered as requested. As we waited he made good use of his time by adjusting to the feel of the aircraft by turning it on axis to the left and then to the right. After what seemed like ages Air Traffic Control told Rob to transit the heli north and then to cross the peritrack to be guided by a Marshall to our parking spot. 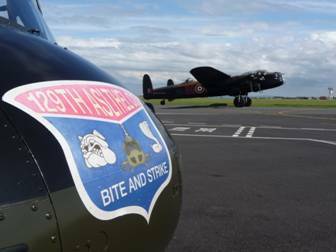 To our surprise the Lancaster of the Battle of Britain Memorial Flight was on the ground being refuelled. What a turn up for the books and as it happened we were parked next to it. 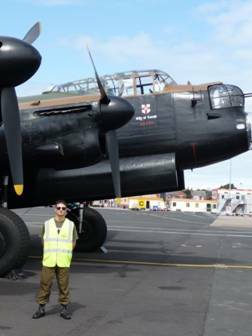 Note from Rob Tierney ……………….Because there are no AVGAS [petrol] bowsers at Blackpool airport to refuel piston engined aircraft, the Lancaster had to be pulled up very close to the fixed installation so the hoses could reach. At least one light aircraft had to wait for the Lancaster to be moved away before it could be refuelled - I hope its pilot made a note in his logbook that his refuel had been delayed by a Lancaster. 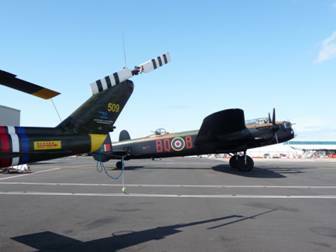 The Lancaster crew were served with 4 chits for the fuel they took on board. When the pump reaches its maximum delivery it stops and issues a chit. When it is restarted it starts another chit. So the pump reached its maximum delivery 3 times such was the amount required (Huey is a thristy bird and usually has 1 chit!). Back to Simon ………….. 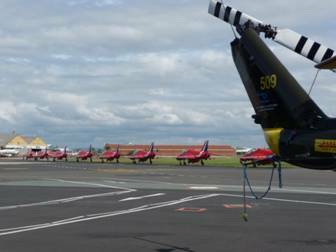 Soon the rotors were tied down and Rob headed off for the Pilots Briefing. Whilst he did that we sorted out the refuelling of the Huey's now rather empty tank. Just over 600 litres were pumped in, much of which would be consumed during the display. With Rob still in the Briefing we had a close look at the Lancaster and had a chat with the crew. They were at Blackpool after they couldn't land at Carlisle Airport as planned, well they could have but they wouldn't have been able to get airborne again for the Sunday. Rob returned from the Briefing to say that he would not be returning to the Airport after the display as the Huey would have to be held on the ground until the 'Reds' had finished doing their thing, so it was decided we would catch a taxi back to Wesham once Rob had lifted to do the Display. We saw the Reds land at the airport and then taxi past us. Shortly afterwards we watched the Lancaster fire up its four Merlins and taxi out to the main runway to depart along with the Spitfire and Hurricane that had been in a hangar over night on the northern side of the airfield. 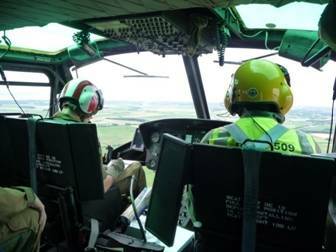 No sooner than they had gone Rob jumped into the Huey and strapped himself in. The now familiar whine of the turbine started to build in intensity as Bradley did the walk round. Rob was on the radio to the Tower who asked him to launch which he did and then hover taxied over the peritrack and settled into a hover to the west of the Tower. He was there for some time waiting for the Vulcan to do its flypast and then spiral climb before departing. Rob gave up hovering and put 509 back on the ground until he was given the all clear after the Vulcan had left. I heard the howl as the Vulcan climbed but unfortunately I didn't see it. Shortly after the ghostly howl Rob lifted 509 again and headed west out to sea before turning north. Just before he left we gave him strict instructions that we wanted to be able to hear him at Blackpool Airport during his display. I'm glad to be able to report that he didn't disappoint. After a 4 hour drive the night before it was good to see that the Sunday dawned clear and fair for the Blackpool Air Show. I only hoped that it would stay clear as 2 years previously during the briefing the briefer had said 'well you won't have any problems with the horizon today!' Unfortunately, by the time it was our turn to display the weather had changed and it took 4 stabs to reach the display location from the holding point of Fleetwood just 4 miles north. So before this year's brief I had a quiet word - no similar statement was made – and the weather remained good throughout. Just don't call me superstitious!! We did consider mounting the display from Phil's 'back garden' but decided against this in case there were changes in timing. This proved just as well for the timing of our display did change to allow the Vulcan to carry out a few manouvres. Displaying the Huey immediately after the Vulcan is rather like the public speaker's conundrum when required to give a public talk immediately after everyone has had a good lunch - how does he keep everyone awake and interested in what he is saying. So it was with a certain amount of relief I heard that Simon could hear Huey from Blackpool airport some way from the seafront display centre. Clearly, going to sleep was not one of the crowd's options. Being at Blackpool airport we were able to get into the hover just in front of the Air Traffic Control Tower and by manouevring the aircraft I was able to follow the Vulcan throughout its appearance. Thus when it entered its departure climb I was able to call the tower for clearance to depart and start my display. Over the sea, even with a good horizon, it takes considerable concentration during the steep turns and so I chose to do the display slightly higher than over land. At the end we emulated the Vulcan's departure by approaching the display centre at 120kts, raising the nose to the climb attitude and pulling full power. However, this rapid climb had to be terminated fairly soon as we had only been cleared to 2,000ft. It was not until just before Fleetwood that we were able to turn in across the coast and set heading for Wesham. Once Huey had been hangared I left to drive south anticipating a difficult trip. However, the most difficult part turned out to be leaving the Blackpool area such was the number of cars leaving the town. Clearly there had been very many people at the seaside that day. Back to Simon’s narrative ………………………. From where we were we couldn't see a great deal of the Display so picked up our things and headed off to catch a taxi. No sooner had we jumped into a cab when the phone rang and it was Rob to say he was back at Wesham and on the ground. About 15 minutes later we pulled into the yard and jumped out to start attaching the ground wheels, etc. As we were sorting things out we heard the sound of approaching jet engines. 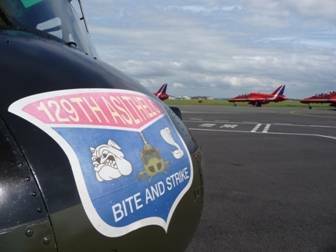 To a man we all looked skyward to see the Red Arrows fly over the top of us in formation……great to have your own low level flyby*. The MUTT was duly hitched up and we inched it and the Huey back under cover. Once inside a final check was made before closing the door and locking up at the end of another good day with 509. * Becky would like it to be noted that following their Display at Blackpool Air Show the Red Arrows also flew low and in formation over their house in Ansdell whilst she and Tony painted their garden fence and she feels that they did that just for her………we don’t like to disallusion her!